Portraits have traditionally been used in banknotes all over the world, and research shows that people tend to recognise faces intuitively.the Eurosystem chose to put a portrait of Europa in the watermark and the hologram of the new series ofÂ euro banknotes. Europa is a figure from Greek mythology.the portrait was taken from a vase at the Louvre in Paris which was found in southern Italy and is over 2,000 years old.this portrait was chosen because it has a clear association with the continent of Europe and also adds a human touch to the banknotes. In Greek mythology, Europa, the daughter of a Phoenician king, was seduced by the god Zeus, in the shape of a bull, who carried her away to crete. The story inspired the ancient Greeks to use â€œEuropeâ€ as a geographical term. The Europa series â‚¬5 banknote was unveiled, on behalf of the Eurosystem, by ECB President Mario Draghi on 10 January 2013 at the Archaeological Museum in Frankfurt am Main. 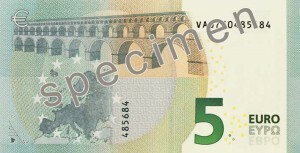 Compared with the first series â‚¬5 banknote, the Europa series has a refreshed design as well as enhanced security features. The new â‚¬5 note will be introduced in the euro area as of 2 May 2013. Portraits have traditionally been used on banknotes all over the world. Research has shown that people tend to recognise faces easily. That’s why a portrait of Europa, a figure from Greek mythology and the origin of the name of our continent, was chosen to be included in the watermark and the hologram of the second series of euro banknotes – the Europa series.